The Civil Service is a resilient and adaptable organisation. Civil servants have shown this on countless occasions - from serving the first coalition government in 65 years during the last Parliament, to delivering a step change in efficiency and new ways of working after the financial crash. You may have read here already about what the EU referendum outcome and what it means for the Civil Service. Clearly, the referendum set a new direction for the country and therefore new challenges and priorities for the Civil Service - ones that we are confident we can rise to. At the same time, the world is changing in other ways too. Digital technology is transforming how people work and their expectations of the services they use, and society is more diverse than it’s ever been. And the recent report of the Iraq Inquiry has reminded us once again of the vital role good planning and sound processes play in ensuring that government operates effectively. Against this background, we have used this year’s Civil Service Live events around the country to launch our vision for creating 'A Brilliant Civil Service' - one fully equipped to respond to current and future challenges. Our - and Permanent Secretary colleagues’ - commitment to that ambition won’t change in light of recent events. In fact, realising the vision of a Civil Service delivering robust policy advice and improved outcomes for the citizens it serves, with effective leaders and skilled people in a great place to work, will clearly help us to meet the challenge of the times. 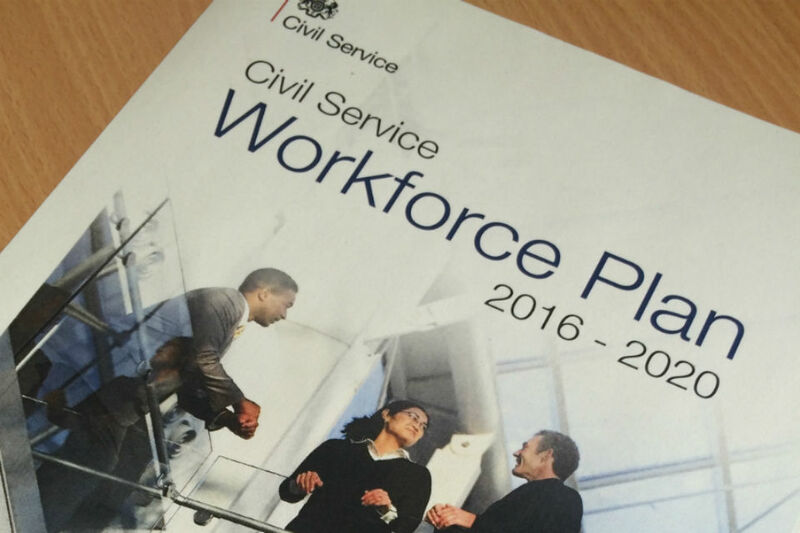 Yesterday, the Minister for the Cabinet Office launched the Civil Service Workforce Plan. We would strongly urge you all to read it. The Plan sets out our workforce priorities for this Parliament and how they support the vision of ‘A Brilliant Civil Service’. A key part of the overall vision, it takes a longer term view of how we will develop our people to meet the challenges we face. The Workforce Plan has been compiled with extensive input from across the Civil Service, and we’ve been testing parts of it at Civil Service Live. As respectively Head and Chief Executive of the Civil Service, we have been heavily involved in this process, and are fully committed to its implementation. The Plan itself sets out how we will develop leaders at all levels who challenge and inspire us to be the best we can be. And how we will build career paths that encourage both breadth of experience and depth of expertise, while providing the skills we need to deliver world-class services. It describes how we will attract and retain people of talent and experience by encouraging greater movement into and around the Civil Service. One very early challenge, obviously, will be how to build up rapidly the necessary expertise to handle new national responsibilities as a result of the EU Referendum result.. The Plan also underlines our aim to be the most inclusive employer in the UK, so that we truly reflect modern Britain and understand the needs of an increasingly diverse society. And it will focus on developing a reward system that is fair to civil servants and the taxpayer - yet flexible enough to attract, retain and develop the very best talent, recognising hard work and success, and the value of vital capability in areas such as digital and commercial. These actions will provide the Civil Service with the leadership, culture, skills and people to react flexibly to national priorities and deal with the unique and complex challenges we now face. Above all, the Workforce Plan is designed to give you - and civil servants to come - the opportunity to make the most of your talent, motivated by our core values, an enduring commitment to public service, and pride in being part of the best Civil Service in the world. I have read the document and it certainly seems that the Civil Service does have lofty ambitions to positively change the experience for both the customer and staff. However, the only group that get a mention with regards to future pay & benefits is the Senior Civil Service - is the plan to deliberately ignore the majority of staff like me, who actually interact with our customers, and instead reward the leaders who don't get hands on with the customers ?. The SCS form a tiny % of staff who work for the Civil Service, its the rest who actually work with the public who do the work. Funny thing - as it is a trading entity the DE&S have offered the SCS grades a 2% rise this year. Question – Why is the MoD unable to retain engineering skills? Comment – according to the IET, engineers in the MoD are paid approximately £15K less than industry. Section 2 - The Civil Service will need to build career paths that develop breadth of experience and depth of expertise. How? I am in a section that should have 5, there are 2 of us. And there are contractors and military officers in the line management route – where can I get promoted to? Section 5 - The Civil Service must develop cost effective and flexible reward structures that enable us to attract, retain and develop the very best talent. Current situation - imposed 3 year pay freeze; withdrawal of contracted increments; and followed up with a 1% pay increase limit until 2020. Result – extremely low morale and a workforce with an average age of about 50. Comment – Is that cost effective in the long term? I also noted that section 5 discusses “significant pay increases within pay bands to retain specific skills and experience” and states “We will review the Senior Civil Service pay framework”. * Is that only for the SCS or all the Civil Service? * What about short skills below SCS? * What if you are on the top of the scale? Plus – all of this to be done under a 1% pay cap. The people who have been in the civil service a long time at a AO grade need to be developed and promoted to EO so low morale can decrease in the department.Every one is so busy meeting their work targets that their is no time for development to the next grade. The dept leaders need to address this problem to develop and promote staff to their best ability. on the flip side of the coin to this, I have been very fortunate, not only have i been promoted to the next grade, I have also managed to get a member of staff through a higher NVQ 3, which i also studied along side them and helped get two members of staff promoted from E1 grades. I think its very important to be invested in, you pay in to get investment back. If you want to attract and retain high-performing staff, you need to incentivize them with competitive pay rates. I cannot claim to have read every word, but I have looked through this document and have concluded that it is positively brimming with ambition and intent - hopefully for everyone, regardless of rank. Some cutting edge HR 'tools' are going to be required to deliver on this and I suggest that our 'blunt instrument' performance management processes are not amongst them. We now have a great opportunity to sharpen and improve them - so let us not waste it. "A motivated and engaged SCS cadre rewarded for their performance, contribution and leadership." Really sums up this document. I agree with the others, this is called a "Workforce Plan" but it focuses on senior management and “leadership” and ignores the people who actually do the work. If the open recruitment actually brings some competent people into the Senior Civil Service, the first thing they will do is tear this plan up and focus on recruiting and training the front line staff. For example, there is an emphasis on digital but every IT project has failed because we lack competent engineers. I am retiring soon, if I had 5 or more years left I would be looking for a job outside the civil service. Great to see the Civil Service is considering open recruitment. The lack of external recruitment has contributed to an increasing age profile, unnecessary delays in recruitment and the reliance on contractors using agencies which demand exorbitant fees. Pity this is starting in SCS roles and not the more common vacancies at lower levels. As much as I agree with your thoughts - how do you think the people that have been on the base point of the pay scale for 7 years feel about new starts coming in £2000 to £3000 above them? The "TEMPORARY" withdrawal of the increments has caused a great deal of bad feeling and bitterness. What vacancies? I'd have thought vacant posts would have been the first to be taken as savings measures/headcount reductions. The incresaed age profile is more to do with a squeeze on pensions benefits leading to later retirement (although at the moment, being 56 in a Department that has to cut its already depleted civilian workforce by 30% by 2020, I'm going to find it a challenge to make it to 60 without having to retire earlier on a reduced pension). Calling it a "brilliant" Civil Service doesn't mean it will be one. It's just delusions from people who are nowhere near the coalface and no doubt it's just another way of introducing change so that whoever gets his or her name on it will get a bonus. I am one of those people who is only still here because I don't have too long to go to retirement but every year with yet another poor pay rise (if at all) I am just getting less and less engaged with my employer. And people wonder why complaints about poor customer service are on the increase. An interesting document, but as others have said, the focus seems to be almost entirely on the SCS (to the detriment of 'ordinary' grades). To be honest, with our imposed pay freeze, no chance of any real pay increase until 2020, no chance of progressing through a payband, massive relocations of offices/staff and changes to terms and pensions, making the Civil Service attractive to new employees will be a real challenge. That's without the potential changes to the CSCS, which will probably be to the detriment of staff leaving. Certainly within HMRC, and the proposed new City locations, competitive pay will need to be looked at now. Otherwise those with skills and ability may well decide to move to a private employer who pays more with a better benefits package. After all, if you're in a situation where you're commuting further (and paying more for travel), you want to ensure the salary reflects that. And therein lies the main problem, as we can train people to the highest levels possible, but unless the pay/benefits package match the private sector, retention is going to be a massive problem. I know my partner is a band O equivalent Manager for a large bank, younger than me at 38, and not only earns more but also retains a retirement age of 60 and access to a full 24 months compensation if exit packages are run. (That's without getting a 4 figure bonus at least once a year, cheaper mortgage, private healthcare etc etc). Whilst it could be argued that there are exceptions to every rule, I don't feel the CS packages have kept track with the private sector. And given the skills needed for the future, we need to ensure that salary, bonuses and rewards are aligned with outside industry. After all, with the living wage estimated to be around £9+ an hour by 2020, our AA and AO staff could effectively be on minimum wage, with Band O staff not much above them (allowing for pension deductions and additional travelling expenses). I attended an assessment centre 3 weeks ago for the Civil Service Higher Apprenticeship Scheme. If successful I will be promoted from AO to O. A civil Service setting up to the new challenge. All are encouraging for the existing and future generations of workforce. Once again a document that focuses on the tiny, already highly paid elite at the top whilst promising nothing to those of us at the bottom who actually do the work. If you want to attract good staff you have got to pay them decent wages. By 2020 the Minimum Wage will be £9.00 per hour. As an AO in HMRC at the top of the pay scale I only earn around £0.20 per hour more than this, and face more years of real terms pay cuts as a result of the current public sector pay policy. I could earn more stacking shelves at my local supermarket. I only stick it out because I'm nearing retirement. Have you seen this, on page 11? Delivering: Efficient, cost-effective exit processes where this is appropriate, which ensure people leaving the organisation are treated with dignity, respect and fairness WHILST ENSURING VALUE FOR MONEY FOR THE TAXPAYER [my emphasis]. Translation: they're going to make it easier to get rid of you; and when they do they are going to slash your redundancy payments. I note that there are many negative comments about this article on "Developing a Brilliant Civil Service". This made me wonder if any of the Senior Civil Servants would care to reply and give some information and confidence that Civil Servants, below SCS, will be considered hen this is implemented and that their pay will be in alignment with industry (or at least somewhere near).